Once used as a source of quality material and potent medicine, today Cannabis still wears stigma of dangerous and illicit drug. We take a look at this illustrious plant’s history. In one way or another, there are very few people who haven’t heard of, or had an experience with, the notorious plant called cannabis. It’s often described as a dangerous and illegal substance with a high risk of abuse, a point of view that totally disregards the real potential of cannabis and its impact on human lives throughout history. In the last decade, the perception of cannabis has slowly changed, owing to the raised awareness of the plant’s true potential. Cannabis was thought to be one of the first plant species cultivated by humans, who discovered its numerous applications thousands of years ago. The range of its uses is incredible - from serving as a raw building material to many therapeutic and other applications. Considering its huge potential, it’s no coincidence that cannabis made home all over the world, but it surely is surprising how in recent times it got such an infamous reputation. Cannabis is a dioecious annual flowering plant that originates from Central Asia, more specifically, from Mongolian and South Siberian regions. It comes in two subspecies, Cannabis sativa and Cannabis Sativa L. - commonly known as hemp. Even though hemp doesn’t have psychoactive properties like its cousin Cannabis sativa, they were both used in ancient times. One of the first recorded cultures ever to use and cultivate cannabis was China back in 5000 BC. There is historical and archaeological evidence of the use of hemp in ancient China for clothing, manufacturing rope and paper, as well as using seeds to make oil and food. The first medicinal use of cannabis was recorded by the Chinese emperor Shen Nung. The Chinese effectively used cannabis for pain relief and gout. 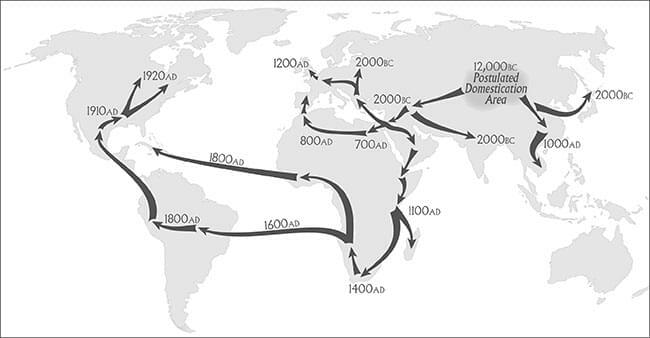 After spreading through China, cannabis found its way to Korea in 2000 BC from where it reached India around 1000BC. People of India discovered many uses of cannabis and like the Chinese, they used it for textiles, as a source of food, and as a potent medicine. Cannabis soon found its way to the Middle East in 1400 BC and it was mostly cultivated by Scythians who were Indo-European nomads. It was the Scythians who brought cannabis to South Russia and Ukraine from where it spread to most European countries. In the following years, because of the Middle Eastern influence, cannabis cultivation began to appear in Africa and by that time it has spread through most of the countries of Europe, Asia, and Africa. Cultivation and use of cannabis were passed from one culture to another, all of which had recognized it as the most valuable crop of the time. At the beginning of the 19th century, cannabis travelled from Africa to South America and Mexico. With many immigrants making their way across the border in 1910-1911, it didn’t take long for cannabis to reach the United States. It was there that the peaceful era of cannabis cultivation and its use came to an end and the turbulent War on Drugs began. Cannabis use was unfortunately tied to criminal acts committed by many Hispanic immigrants, and the prejudice towards the herb was starting to rise. Many newspapers were giving marijuana a bad name, and it all led to cannabis criminalization in the United States. The first state that prohibited marijuana use was Utah in 1915. Many followed, and by 1931 cannabis was outlawed in 29 states. With the work of the Federal Bureau of Narcotics and Commissioner Harry Aslinger in 1937, Marijuana Tax Act was enforced, and cannabis possession and use were criminalized throughout the United States. The law was the same for both marijuana and hemp, regardless of the lack of psychoactive substance in the latter. Many suspect that a powerful lobby in the fossil and paper market was feeling threatened by hemp - it being a more competitive product - and that they influenced state laws and government to heavily regulate or ban hemp production. Today, the federal government still classifies marijuana as a Schedule I controlled substance, indicating it has a high potential for abuse and addiction with no accepted medicinal uses. Even though it is still illegal in many U.S. states and European countries, the view on cannabis is slowly changing. In 1976 Netherlands decriminalized cannabis use and in 1980 cannabis was legal for retail sale in popular “coffee shops”. Spain has seen many private cannabis clubs opening up raising awareness of responsible use. The Czech Republic made medical cannabis legal for purchase and use for patients with a valid prescription, although they are struggling to produce the cannabis needed to meet the medical demand. Over the past few years the U.S. perception of cannabis has changed and thanks to the raising national awareness, 32 states have legalized marijuana for medicinal use. With the significant amount of new scientific research on cannabis and with conclusive evidence of medicinal potential, cannabis is finding its way back into the community. Hopefully, the long tradition of this plant will continue to flourish, and it will again be recognized as a plant with huge potential, both medical and economic, as it was many years ago. The plant’s name cannabis originates from the Greek word κάνναβις (kánnabis), which was originally a Scythian word, and the word Hemp may also be a variant of a word from the same Scythian source. Later, Scythian expressions cannabis and hemp spread throughout the Indo-European languages. In 1548 Oxford English Dictionary recorded the first use of the expression Cannabis sativa. The name marijuana or marihuana for Cannabis sativa has more of a folk etymology. The use of the word marijuana originated in Mexico among Mexican Spanish natives, and it’s associated with a female name Maria Juana, but we are yet to discover the story that reveals the connection between the two. The word was excessively used back in the 1930s by the press to give cannabis an alternative foreign-sounding name, making it seem more dangerous and, in that way, disaffecting the American people from it. Another theory is that the word marijuana comes from the Chinese word for hemp “ma”. It is thought Chinese explorers called the flower of cannabis “ma ren hua,” meaning hemp seed flower. This may have been picked up on by Spanish natives in the Americas, giving another potential source of the name.